Getting fired, unfortunately, can happen to the best of us. Regardless of the circumstances, what should you do if you've been fired? First of all, don't beat yourself up. Don't dwell on it, since that won't help your situation. Instead, focus on what you are going to do next and how you are going to find another job. Keep in mind that another hurdle – the stigma of being fired – has just been added to your job search. That said, there are ways you can address this issue and put it in at least a neutral, if not a positive, light. 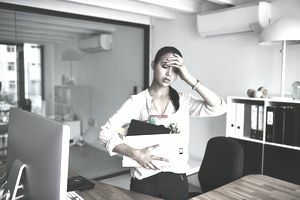 Even though it's difficult, you can make a bad situation worse by doing or saying the wrong thing to the wrong people when you have been fired. It's natural to feel angry, sad, and frustrated; just make sure to restrict negative comment and complaints to your closest friends and family. But don't just walk out the door. There are things you need to know before you can move on. Here is what to ask your employer about getting fired, including questions about severance pay, benefits, unemployment, and potential references. If you are feeling emotional, shocked, or otherwise unprepared for this conversation, you can ask if you can make an appointment to discuss these issues. In some cases, you may want to appeal your firing. However, it's best to address your concerns the day you are fired. Once you are home and assessing your next steps, it'll be important to know when your last paycheck will arrive and if the employer will provide a neutral reference that doesn't mention you being fired. Before you begin a job search, consider where you stand from a legal perspective. Was your firing legitimate or could it be considered wrongful termination? Can you, or should you, consider suing for wrongful termination? Are you eligible for unemployment benefits? If you were fired for misconduct you may not be eligible, but don't assume that is the case. Check with your state unemployment office, especially if you have a different opinion than your employer does about how you parted ways. In many cases, if it isn't clear-cut, the unemployment office will lean towards the unemployed job seeker, rather than the employer, when making a decision on unemployment compensation benefits. All your job search correspondence must be positive. There is no need to mention that you were fired in your resume or in your cover letters. Make sure your cover letters address the position you are applying for and why, and how, you are qualified for it. That's all you need to do. There is no point in bringing up the circumstances of your leaving until you have to. When filling out job applications, don't be negative, but do be honest and don't lie, because it will come back to haunt you. You can use language like "the job ended" or "terminated" if you need to state why you are no longer working at the job. If you are specifically asked if you were fired, you need to answer yes. Lying on a job application is grounds for dismissal at any time in the future and could cost you future unemployment benefits. Here's where getting fired is going to matter most. You can be sure you are going to be asked the question "Why did you leave your last job?" The best bet is to keep it brief and to the point and avoid badmouthing your former employer. Sometimes it's truthful to say "the position wasn't a good fit, and we parted on good terms" instead of saying "I was fired." However you address it, don't lie, because it may come back to haunt you if a potential employer checks references or conducts a background check. Take some time to prepare answers to questions about being fired, so you know exactly what you'll say, instead of trying to come up with an answer on the spot. The more prepared you are, the less the firing will create a negative impression for an interviewer. As hard as it may be, you need to get over getting fired and move on. You need to be able to convince employers that, regardless of what happened in the past, you are a strong candidate for a new position and can do the job. Focusing on the skills and experience you have, rather than the firing, will help sell you to the employer and will help you get the job. Do You Know What Former Employers Can Say About You?